Made by The F M Abbott Company in San Francisco, San Francisco county, California, United States, North and Central America, 1911-1916. 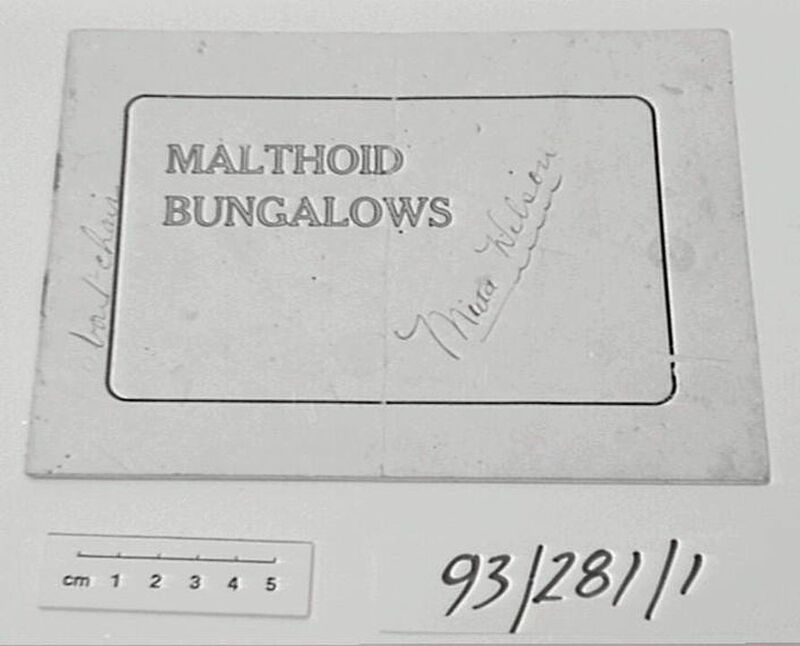 Booklet, 'Malthoid Bungalows', The Paraffine Paint Company, rectangular, horizontal format, soft cover, white paper, front cover printed with black border and title in red lettering outlined in black, and has a handwritten inscription in black ink, the back cover features the company logo, trademark and printer's note, the booklet contains 16 pages of text and illustrations promoting use of Malthoid roofing materials, printed both sides, no pagination, illustrated with black and white, and tinted polychrome photographs of houses roofed with 'Malthoid', accompanied by information about the buildings, their owners, and the products they've used, the testimonials of satisfied customers, and instructions for laying the product. Printed on back cover: in circular logo design - "WATERPROOF/ WEATHERPROOF/ TRADE/ MALTHOID/ MARK/ THE PARAFFINE PAINT COMPANY/ SAN FRANCISCO. CALIFORNIA. U.S."; beneath border in bottom right corner: "PRESS OF THE F.M. ABBOTT COMPANY, SAN FRANCISCO"; Hand written on front cover: along border on left hand side - "about chair"; diagonally across centre - "M[ie]ta Wilson". The Paraffine Paint company, commissioned or published the booklet, in order to promote their product 'Malthoid' roof cladding. Printed by "The Press of the F.M. Abbott Company, San Francisco", as indicated by note printed on the back cover. The Paraffine Paint Company would have used the booklet to promote their product, 'Malthoid' roof cladding.